Yesterday my little brother turned 21! I still remember the night he was born even though I wasn’t quite 4. It’s blazed into my mind of me in the car on the way to the hospital to meet him screaming at my uncle to turn around and return him to wherever he came from… the receipt has probably expired by now, I think. But that’s okay, he’s kind of grown on me. My brother and I always had a love hate relationship growing up. We loved each other because we were siblings, but let me give you a few examples of hate. One time when I was babysitting I made a box of Banquet Chicken for lunch for him and his friend. Well I gave the drumstick to my brother’s friend knowing it was my brother’s favorite piece, he got so mad at me he took the drumstick and threw it through the window. That one was a fun one to explain to my parents. The second most notorious story is that I drug my brother across the floor by his arm and it dislocated his shoulder. My mom actually told me that at the time we were getting along. See! I wasn’t trying to be mean. And finally, when I was a senior in high school and he was a freshman, he got into a fist fight with another kid. I was in the classroom right next to where the fight was happening and when I saw it was the two of them, I pushed through the crowd, split them up and marched their asses down to the Principal’s office. We seemed to always be looking for a way to get the other in trouble. And if we did get in trouble, we made sure to bring the other down with us. But since he graduated high school, we’ve gotten along much better. Now you’d never even know we used to fight every time we were in a room together. We’re still very different, but we get a long and actually like each other now. But I did recall how much my brother loved Cinnamon Toast Crunch when we were kids and thought it would a fun idea to make him a Cinnamon Toast Crunch Cake for his birthday. He wanted his own small cake and I made cupcakes for everyone else. I made him a 6 inch two layer white cake with edges rolled in sweet cinnamon sugar and whipped frosting loaded with Cinnamon Toast Crunch and topped with it too! I didn’t add any extra cinnamon or swirl into the cake itself as I wanted to have a nice balance of flavors. 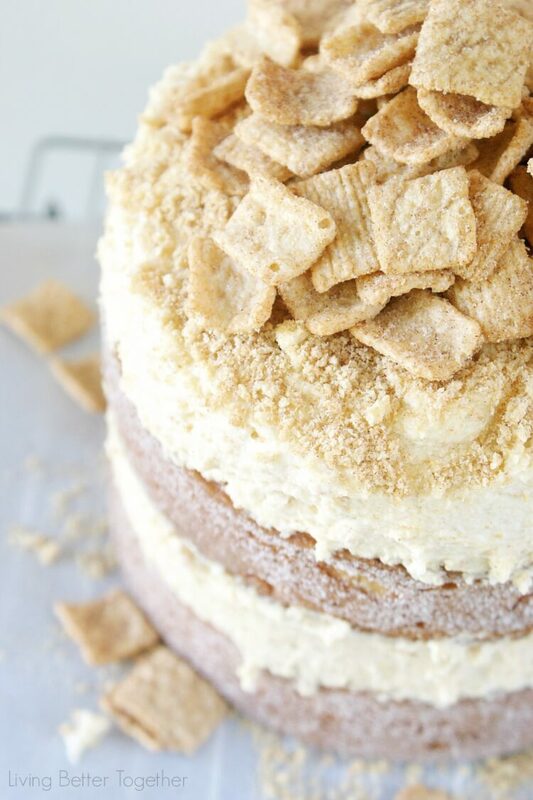 If you have a Cinnamon Toast Crunch lover in your house, you best plan on making this for their next birthday cake, because it’s awesome! 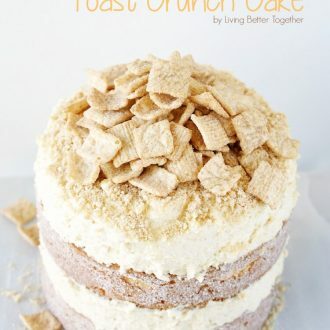 A light and fluffy cake inspired by the famous cereal! Combine ingredients in a large bowl or stand mixer and mix until well combined. Evenly distribute cake batter into pans, approximately 1 1/2 cups of batter in each. Bake for 25-30 minutes until toothpick comes clean. Remove cakes from oven and pan and place on cooling rack. Once cakes have cooled, brush the edges with melted butter and roll in a mix of cinnamon sugar. Combine heavy cream, confectioners' sugar, pudding mix, and cinnamon in a large bowl or stand mixer and beat until light and fluffy. Add Cinnamon Toast Crunch to a food processor and pulse into a powder. 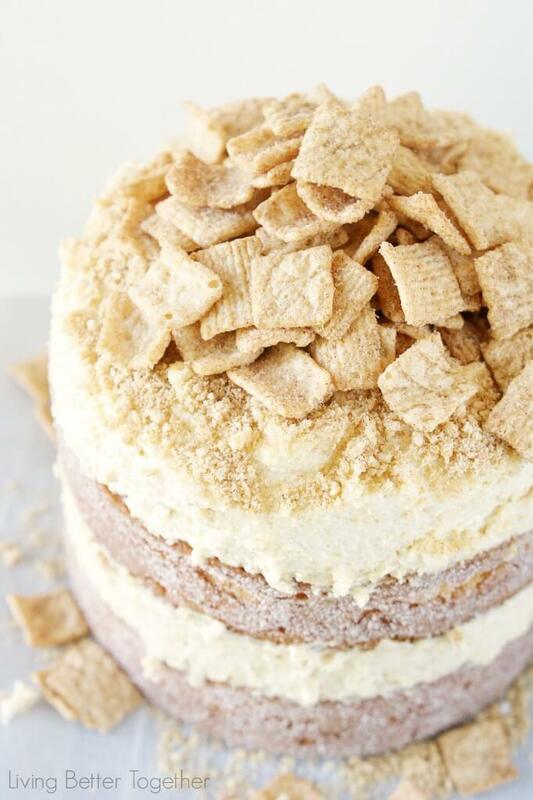 Fold Cinnamon Toast Crunch Powder into frosting. Add about 1 1/2 cups of frosting to the first layer of cake. Add the second cake layer on top of the frosting. Add another 1 1/2 cups of frosting on top of the second layer and spread out evenly. Use a frosting spatula or butter knife to neaten up the frosting on the sides. I made up the other layer with another 1 1/2 cups of frosting and kept it to the side. 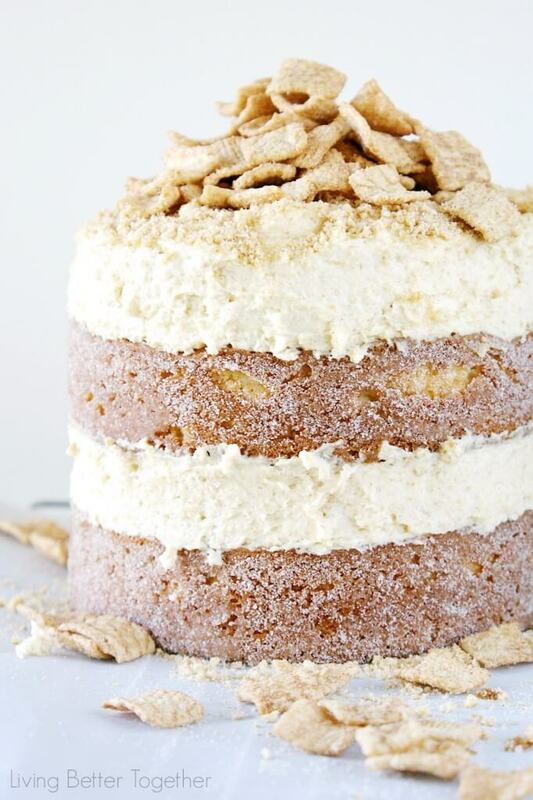 To top the cake off, pulse another cup of Cinnamon Toast Crunch in the food processor and then sprinkle it on top of the top layer of frosting. Sprinkle with a cup or so of whole Cinnamon Toast Crunch Cereal. Cake is best served within a couple of hours once frosted. I associate my brother with sugar cereals too – we bonded over trying to convince our parents to let us have them. I’m sure mine would love this cake as well – and he’s going to be 41 in a few months! This would be a perfect way to celebrate! My brother loved when I got my license because it meant I got to start doing the grocery shopping and sugary cereals would find their way into the house! Thanks so much for sharing, it was such a fun cake to make and he wasn’t willing to share. Good thing I made an extra layer for my husband and I! That is one beauty of a cake, so gorgeous and I bet it tastes as good as it looks!! It tasted like a coffee cake, so good! Thanks for stopping by! Thanks, Dan! It was a huge hit! My husband and little boy both love this cereal,and I know would flip for this cake. Thanks so much. Oh, you’ll definitely have to make it for them! It’s so good! It’s so easy to whip up, you should totally have someone make it for you! What a gorgeous cake Rebecca! Thank you! It tasted amazing too, I’m sad it’s all gone, but something tells me it will be requested again soon! I love hearing the stories of your brother!! I witnessed my brother in a fist fight once but I was not nearly as cool, I started screaming at him and totally crying. I was only in 7th grade, but still, embarrassing. 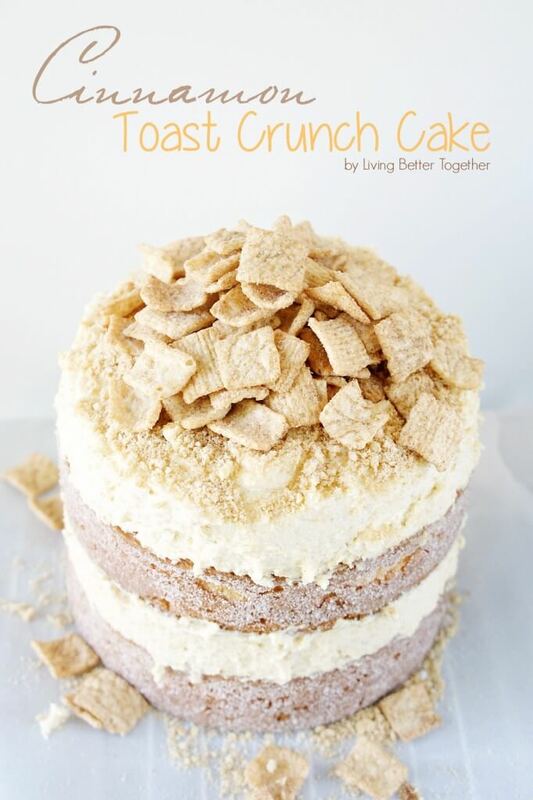 My brother and I also both looooove Cinnamon Toast Crunch (It was our favorite growing up) so this cake sounds awesome!!!! I was furious, I think I yelled at both of them, but don’t remember. It seems like Cinnamon Toast Crunch is a common bonding agent between siblings! Thanks so much for stopping by! It was amazing, I’m sad it’s all gone! Thanks so much for stopping by and for the invite!